Finding a jogging stroller that meets all my jogging needs isn’t an easy task. There are a lot of features that make or break the deal when I am researching jogging strollers. I am mostly concerned with the kind of wheels it has and if they will be able to withstand long jogging sessions on different terrains. The type of canopy and breaks a jogging stroller has are also important for safety reasons. Below I will be giving a review of two jeep jogging strollers. You’ll see some of the pros and cons of each stroller as well as my thoughts on each one. It has a five-point harness, which is great for keeping kids secured safely. It’s also more difficult for kids to escape from a five-point harness than it is from just the lap belt. There is an extendable canopy with sun visor ensuring that little riders will be protected from the sun. The seat is comfortably padded and has more than one position recline. Some extras on this jeep jogging stroller include padded shoulder straps, a handlebar with foam padding, and a parent tray that includes two cup holders. There is also a nice size storage basket. 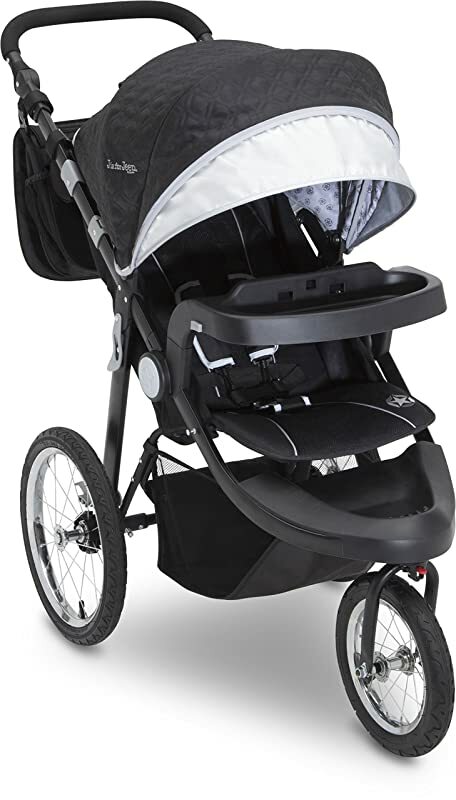 This stroller has a quick and easy locking mechanism and can be swiftly folded when not in use. One of the best things about this stroller is that it’s only 21 pounds! That means it can be easy hauled in and out of trunks when traveling with it. It has air tires, not foam. While air tires are usually better for jogging, they also require more care than foam. Although it is only 21 pounds and can fold easily, it does not fold quite as compact as I would like. It’s sort of bulky when folded and will require more trunk space. The weight limit on this jogger is only 50 pounds. Some toddlers are above that weight limit and would not be able to use this stroller. It comes with its own diaper bag or at least what seems like one. It has a detachable bag that can carry most of the essentials that you and your child will need on your jogging trip. The handlebar is adjustable! It can be changed to different positions to meet your comfort and that of your partner. The seat can be reclined to more than one position and the seat belt has comfortable shoulder straps. The included canopy is extendable and has a sun visor for added protection. There is also a peek-a-boo window to help you check on your little one without stopping your jogging session. It is compatible with various car seat brands and they can be used with an adapter. The Graco Snugride Click Connect, the Evenflo Nurture, Evenflo Embrace, and the Chicco KeyFit are all compatible. It has a safety tether to help maintain control of the stroller in addition to the breaks at the bottom. At nearly 30 pounds, it is a little on the heavy side. It’s still a decent weight, but it might require more effort to get in and out of a car’s trunk. Similar to the stroller above, this one also has a bit of a bulky frame when folded. It also has air tires, which require a little more care in the long run. 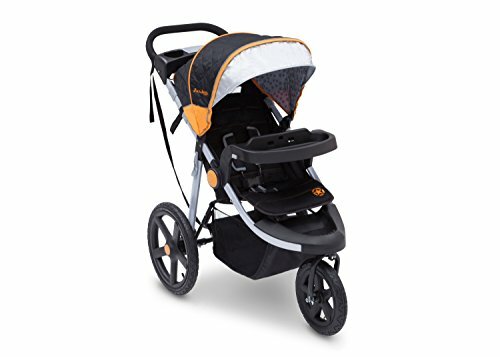 Overall, both of these jogging strollers have all the main features that are important to me. The cons are a bit of an inconvenience, but not necessarily enough to break the deal for me. Although, I am leaning more towards the first stroller since it is a bit lighter in weight and will be easier for me to handle on my own. I hope the above review will help you decide which stroller will fit your needs and the needs of your family. Photo & Video credits: Amazon, Jeep World, Baby Gizmo, TTPM Baby Gear Reviews.